I’ve spent a lot of time judging or coordinating writing contests, and one entertaining part of that is reading all of the comments the judges put on the score sheets. Sometimes the preliminary or professional judge just doesn’t “get” the entry. Sometimes the writing really is hard to understand. Well, it sounds like that story had plenty of conflict. For your reading pleasure, I compiled some of my favorite comments (one or two might be mine, but most aren’t) from actual score sheets, so if you’re confused by a review comment or a contest score, this should encourage you. I was slightly disappointed that this wasn’t about cannibalism, given the title! The poem is marathon long. There are some really great phrases in this poem, but it’s not quite enough to hold together amid some of the “huh?” moments. I liked the use of complete sentences. Just a suggestion, you might spend more time fleshing out the doctor. Again, this reads more like a dry newspaper article than like an interesting story. I clearly have no idea where this is going, but I would guess the author does. The protagonist is conflicted. That’s clear. But, again, I don’t know where this is going. The title said there was a villein…who is it? Did you really mean “mice”? What do you mean the house is “known for its groans”? it’s haunted or it’s poorly constructed? If this were a first chapter, I would give it great marks for creativity- but as it is claimed as a memoir, it lacks engagement. However, the content bothered me because the observer is highly judgmental about someone he/she has never met. Instead, we see an all too common debate end in random, senseless death. I assume – I really don’t know if Stuyvesant had a peg leg. Not a bad idea but it needs to be flushed out. What happens in the garden other than just walking around smelling things? I did not count off, but most authorities now believe it was probably a fig tree rather than an apple, based on the location. Interesting concept, though somewhat abstract. Poetry about poetry. The irony of this is that it’s a very clichéd description of a person who stereotypically employs a lot of clichés. Or is it meant to be ironically ironic? When you back your car into a post, the sound is horrendous. What does plane wing on tarmac sound like? The author clearly has mechanical talent, but characterization, conflict, plot and interest are, unfortunately, lacking in this piece. I know many people who will not read present tense. Archery practice is not gripping. I am unsure how the protagonist can know Amelia’s feet are tough. There is an awful lot of peeing in one chapter – 3 times in the first 10 pages. Is this intentional? You are confused between internal monologue and deep third person. I had to remind myself that this is poetry and the use of the proper scientific term would distract from the poet’s meaning. Don’t know much about Louise, except that she cries and this irritates the narrator. 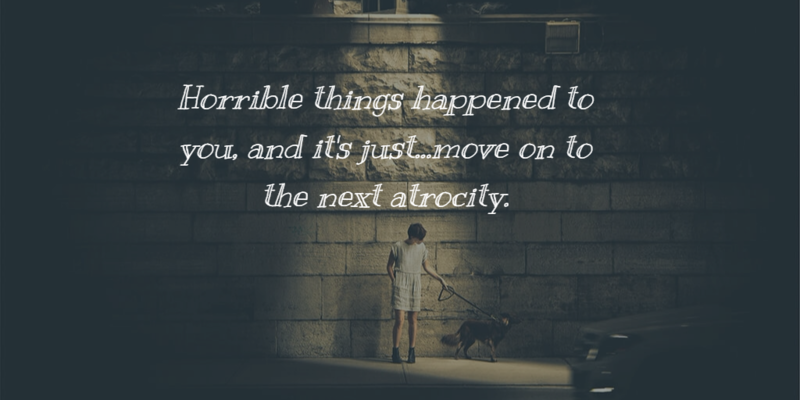 Horrible things happened to you, and it’s just…move on to the next atrocity. I also wondered initially whether “my drainpipe” was some kind of euphemism!!! There’s a dead body. What did that smell like? Thumbnail sketches of characters followed by a hammer to the thumb. What personal significance, other than occasionally cutting its hair, does the statue have to the narrator? While there are periods throughout the poem, there are no verbs, only participles. Thus there are no complete clauses or thoughts, only descriptions. Be cautious about putting your name into poems submitted for contests. If the poet gets a few of the pesky minnows in this poem out of the way, it will be a much stronger piece. This piece doesn’t seem to know what it wants to be. The second part of the piece read like a clickbait story on a pseudoscientific website that someone posted on a blog or Facebook. A good story idea and good conflict hampered by execution. What the Heck is a Kelpie?